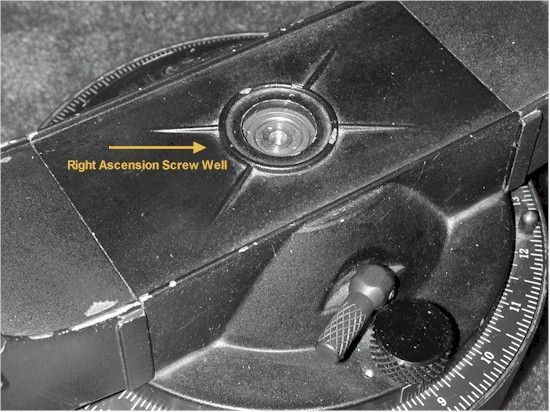 In order to supply encoder hardware for the fork mounted Celestron C8 telescope, we need to have information about the right ascension axis center screw hole. Generally we can guess at this information based on the date of manufacture. However, there were great variations and inconsistencies in the manufacturing specifications from inception through 1985. The more information you can provide us, the more likely we will be able to provide the correct main gear for the right ascension axis. Use the following as a guide, remembering that we have seen exceptions to almost every bit of information listed. The optical tube will be black. The right ascension axis center screw hole will have a 10-32 thread. The optical tube will be orange or black. The right ascension axis center screw hole will have a 10-32 thread in most cases but it will have an 8-32 thread in a few cases. The optical tube will be orange. The right ascension axis center screw hole will have an 8-32 thread. If there is no hole in the center of the right ascension axis it will need to be drilled. If the center hole is not threaded it will need to be tapped (to JMI specifications). If the hole is threaded we will need to know the thread size. Check the declination thread size also. Some scopes have non-standard 10-24 theads on both axes. We also need to know the inside diameter and depth of the right ascension screw well (click on picture to enlarge). When measuring the depth, include any ribs that protrude up from the surface. Placing a straight edge (such as a ruler) across the top of the hole will help in making this measurement. We may need more specific information such as drawings and dimensions. Please note that the fork mounted C8 is not the same as the Ultima 8, Celestar 8, Celestar 8 Deluxe, Fastar 8 or any German equatorially mounted C8 which all require different hardware. The C8 Powerstar PEC, with the central right ascension locking knob, needs some special consideration. This telescope was built for encoders but included a flaw in the design. The clock drive movement is not registered by the encoders. This leaves two options with both having drawbacks that must be considered. The first option is to use the MAX computer's ET (equatorial table) mode since normal R. A. tracking will not be seen by the encoders. The drawback here is that the telescope must be polar aligned for the encoder system to work properly. The second option is to use the EQ or EP mode and turn off the clock drive. With this option, the scope does not need to be polar aligned. The obvious drawback is that the telescope will not be able to track in right ascension.